25 Father’s Days ago, my father shook me out of bed and asked me to go play golf at Harding Park which is located just across the street from the Olympic Club which back in 1987 was hosting the US Open. 25 years later I will be thinking of my dad and that awesome morning as the US Open is played again at the Olympic Club. 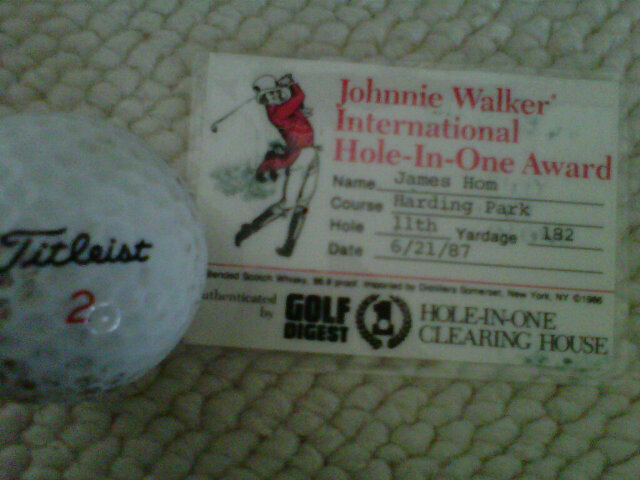 You see, on that Father’s Day 25 years ago, my dad hit a hole-in-one on the 11th hole at Harding Park. The smile and embarrassed laugh my dad gave will never be forgotten. All I could say was “Happy Father’s Day”. His comment, ” Thanks, for the great day”. I like to think it wasn’t about the hole in one , but sharing it with friends and family. Golf will always be a Father’s Day sport as long as the US Open takes place over Father’s Day weekend. The US Open, golf, and that day 25 years ago will always make it more than a Hallmark Holiday in my book. The other night I was driving home when my mother gave me a call. She was lonely and wanted to have dinner. This might sound trivial to some, but since my father passed,my mother has been a non-stop whirlwind of energy. A breast cancer survivor, she has traveled the world (South Africa, Egypt, Germany, China (2x), Japan, India, Hungary, South America, Morocco, Russia, Yugoslavia, Kenya, Maldives, Seychelles, etc.). We joke in my family that we need to put a tracer on my mother as you never know where she is and although I live within a mile of her home, getting her to find a date to babysit is not an easy task. Playing Mah-Jong with her friends, seeing the latest movies, morning tai-chi, and such I have always afraid my mother never really stopped to mourn my father’s death. When I picked her up she wasn’t her cheery self. Her other two children were on vacation and my own family was on the East Coast visiting my in-laws. We always hear about Fathers and sons, Fathers and daughters, and Mothers and daughters, but “Momma’s boys” has always had a bad connotation. I wouldn’t call myself a Momma’s boy. We’ve always butted heads and being the eldest we graduated to a peer-to-peer relationship pretty quickly. It was like having 3 adults in the house and my 2 younger siblings were the kids. Tonight was different. My mom seemed lonely and tired. She admitted that the cancer had given her the desire to do and see everything. She admitted that she missed her family. Most of all, she admitted that she was really missing my dad. I realized that she just wanted to talk and I let her (by all means, not a normal interaction for me and my mom) She talked all through dinner about what she missed. I just listened and teared up. Finally as we ate our fortune cookies, she apologized for talking all during dinner and asked me if I still missed my dad. I had seen the above Nike commercial the day before. It reminded me of my nightly running and how I process thoughts and ideas each night to clear my head. According to the agency it is meant to reflect the community of survivors and people who follow Lance Armstong and encourage him on a daily basis through his trials and tribulations. When I processed my mother’s question, I told her that amazingly, I think that while I will always miss my dad, that I am finished mourning him. That said, I don’t think I ever have a run at night where some thought of my dad doesn’t enter and pass through my thoughts. 4. Spend a month in France and Italy driving the countrysides and eating great food. We’ll throw in a few museums and major cities along the way. After coming up with the list, my mother was so excited. The list combined some things that I wished I had done with my father and I learned from my mom about some things my dad had said he would have wanted to share with his children. It was quite surprising to hear some of his thoughts that I had never heard before. This is not a crazy list and there are many things on the list that are much more grand, but they are personal to me and personal to my dad. My mom loved it and by the end she was so happy that she wants to come along! I definitely need to listen to the voices in my head more often. The four days of the Thanksgiving holiday give you just enough time to be thankful for what you’ve received over the past 11 months but give you just barely enough time to rest before the onslaught of the holidays consumes you. These days we are not only hit with Christmas, but we have Kwanzaa and Chanukkah, and we also have commercially Black Friday and Cyber Monday. If you’re in the affiliate world it just hits you all at once. The bargains are there to be had but getting those discount codes in front of everyone is becoming more and more difficult. Consumers are also more savvy. They know that there is more demand for your business that ever. I even saw one site giving away a $1000 gift certificate to their Twitter follower that gave them the right answer. The funny thing is that this company only had 233 followers! What odds! Are they kidding? They didn’t even have much of anything on their site that I wanted to buy. I think it is funny that this promotion couldn’t even get people to follow them on Twitter. I even just checked and noticed that they lost 3 members since I last looked. This goes to show how brand awareness is still significant when running promotions on the web. The social web is not as viral as it once was. People are only following things they know and trust. They aren’t blindly following people and becoming friends with strangers online. It does concern me about the validity of the networks and friendships being created on sites such as Twitter, Facebook and MySpace. Anyway, I digress as usual. I am truly rejuvenated in thought, body and soul. Over the holidays it hit me. Thanksgiving really has more meaning to me because it is the holiday where I met my wife. Where I met her 25 years ago and for that I will be forever thankful for that fateful night. 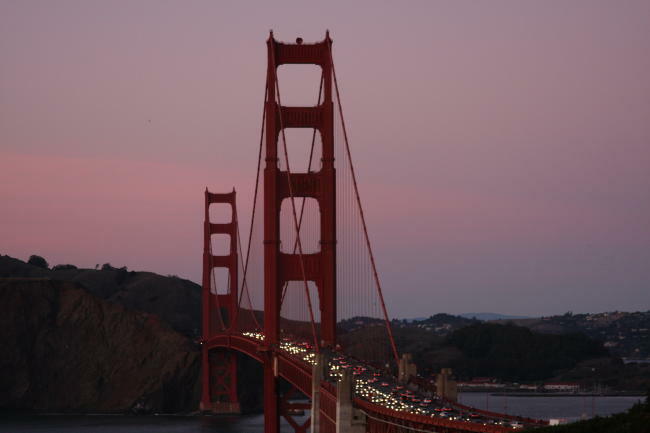 25 years later I ran out to the bridge and soaked in the beauty of the Golden Gate Bridge and took some photos of one of the most beautiful spots on Earth. Earlier that day I had watched my 10 year old son play golf and he played his greatest round ever, almost beating me. In his mind he was playing golf with his dad. In my mind I was also playing golf with my dad. There are so many similarities between my son and his grandfather. The smile, the giggles, the swagger, and his incredible casual demeanor….his spirit lives on in my son. Did I mention their golf game? Such a beauty to watch. I only wish they could have played golf together. Such a pair they would have made. The holidays are tough on many and I still feel the loss of my father during the holidays. We had some of my aunties (my dad’s younger sisters) over for Thanksgiving. I don’t remember how it happened or what the conversation was that led to it, but we all broke down over dessert as my 75 year old aunt told me how much she missed my dad and wished he were still around. Imagine that. A 75 year old lady still needing the comfort of her older brother. My sister and other aunt and I just shed a tear and for about 2 minutes as we couldn’t talk as we tried to compose ourselves before pushing on, but it was nice to pay respect to my father and remind myself of how thankful I was to be the son of a man that still emitted those emotions years after his death. My brother-in-law who never really knew my dad I think was very touched by the scene. I don’t know why, but that night more than ever I felt my dad with me on my run. I felt like I was running in solitude but I ran like the wind and ran faster than I had in a long time. Sometimes, revisiting your past I guess can just remind you of your youth. I had a friend turn 45 the other day and I casually sent her a link to Alphaville’s “Forever Young”. It seemed so a propos. She responded so affirmatively that it made me smile. Then I found Rod Stewart’s “Forever Young”. The words rang true and all I could think is how good and motivating those words are…..enough to get me through this holiday season at least. These days I’ve been spending a lot of time on new types of social media both out of personal interest as well as for my company business as I’ve somewhat become their social media community manager. An interesting time to be attacking such a topic. It has both permeated my personal as well as my work life. It does intrigue me that there has been so much talk about moms. In fact not just a little but way too much. Don’t get me wrong, moms are an intriguing and wonderful group of people who have many different interests as well as power both in the online and online world. On Twitter there are Twittermoms and Momlogic, there are websites such as iVillage, powerful female influencers like Oprah,etc. I’ve been asked constantly what I’m going to do to penetrate the world of moms! I laugh becuase I argue about my cousins who are the dads who stay at home while the moms work. I also think dads need more help than moms. More importantly I think these women are struggling to get away from the identity as “just moms” . It has me scratching my head as a marketer who has always been told that the most powerful and fluential groups are the male 18-34 consumers as well as the always moving group of Baby Boomers. Maybe it’s that dads don;t just view themselves as dads. Yeah, we’re dads, but we’re more than that. I just hope people don’t target me as a dad and only as a dad. We’re husbands, we’re lawyers, we’re doctors, we’re sons, we’re grandsons, etc. Okay, well as a dad and husband, I’ve been through so much this year. I guess I want to spend more time enjoying those other things. My week ended though on a tough note as a dad. I’ve been having a beef with my son’s music teacher. You know the kind of music teacher that thinks the arts is the most important thing in a man’s life? Also the kind of choir master, and more importantly teacher, who believes that it is his duty to tell parents how to raise their children. This guy had the gall to tell me that I needed to sign a contract for my son to sing in his volunteer choir. I told him that in the future that the only contract I will have with my son is the unwritten one between a father and a son. He then threatened me by saying that if I didn’t sign his silly contract that he could possibly decide not to give my son his little “pin” at the end of the year. What? My son’s baseball team doesn’t require this. My son’s cub scout master doesn’t require this. What ever happened to scouts honor? In the end this teacher drags me into this with our school asst. principal. This is the same school I attended and the one that I volunteer many countless hours in front of phones and stuffing bags of goodies for fundraisers. What has this world come to that they need a parent to sign a contract to say that they will be responsible for making sure that their son will be committed to their elective activity? I did take this as an opportunity to educate my son and daughter about the importance of commitments, the importance of making the right decisions, and how to deal with conflict. It is not a conversation one wants to have to have on such a serious note with a 9 and a 7 year old, but with cancer, death and other life situations that our children have been through, I am so lucky that I have two kids who can digest such serious matters yet enjoy life thoroughly as kids. I came away so impressed with my children. More importantly as a dad I found I have a son who knows good reason, understands how people and friends are more important than small material things like a “music pin”. Maybe its the innocence of youth, but I couldn’t be happier with how my son and daughter listened, giggled and asked questions during our little talk. They may never know how proud I am of them, but I am. These days as parents we work so hard to make a good life for our children and shelter them from the harsh realities of life such the little girl who was killed in Tracy, CA, the wars in the Middle East, the downfall of our banking and auto making industries and the sicknesses and illnesses around the world. Targeting these individuals for retail and financial reward is one thing, but giving them the resources they need to handle all the things they need to be a good parent is another. In the end though, it is up to the parents to make the difficult choices for their children when they aren’t old enough to make it themselves, and help them learn how to do it on their own in other cases.